The Pier to Forever: Enjoy Chapter Eight of Firefly: Slingshot--a Fan-Fiction Tribute to Firefly! 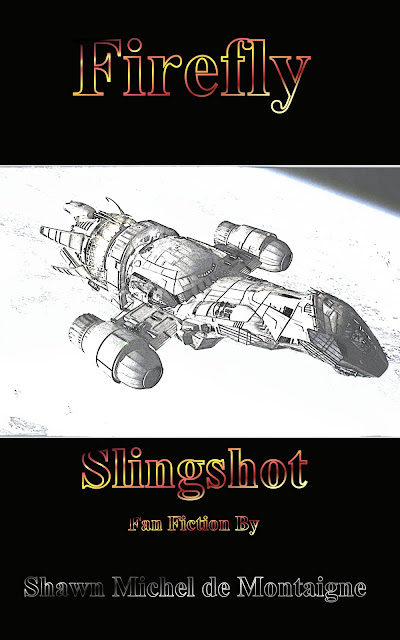 Enjoy Chapter Eight of Firefly: Slingshot--a Fan-Fiction Tribute to Firefly! Truth was, Mal had never been to Londinium his entire life. Neither had Jayne, Kaylee, or Zoe. Deader told the story of how her niece had been invited to some convention there with her school, but had to cancel when war broke out. That was the closest Deader got to it. Only Simon and River had ever visited the seat of the Allied Planets, and then only twice. Their father was an Appointee of the Medical Elect and took his family to Londinium when the annual meetings took place there. Bellerophon to Londinium was an eleven-day burn. In that time Inara and Deader had gotten to know each other a little, and it was obvious, at least to Mal, that they hadn’t decided if they liked each other or not. Deader was terse with Inara; and Inara was terse in return. “As much as Capitals like to think they are free of crime, they aren’t. It’s just hidden better,” replied Inara. “Do we have port coordinates, Captain?” asked Kaylee. Simon sat next to her. He had stayed silent for most of dinner and now this discussion. It was obvious he was nervous about landing there, as was River, who leaned against the wall at the galley’s entrance. The crew stared at one another, confused, then back at her. “What, you have to take a shot that makes you somehow acceptable?” snorted Mal. The crew quietened. She looked at them all, one by one, before coming back to Mal, whose face was plum-red. “How many folks you’ve done business with or stuck a gun in the face of or helped out would know you were an Independent, Captain?” shot back Deader. She glanced around at the crew; they all nodded as if it was common knowledge, which it was. He had been staring down at the table. He nodded without looking up. “I would like to test some of that ‘gunk,’ as you called it, before we put it into our bodies,” said Simon. “An excellent idea,” said Mal, gazing up at him. There was a time that Mal could scarcely tolerate Simon or his sister. River was still a royal pain in the keister at times; but Simon … the ship’s doctor had proven not just to be an invaluable member of the crew, but also someone Mal found he could place his trust in to do what was right for everyone involved. He found himself admiring Simon more and more; as a result, their friendship, years in the making and always very gradual, had finally begun to take root and grow. He didn’t have to go on. Everyone save Deader was staring at him and nodding emphatically, even River. Zoe snickered. So did River. Kaylee blushed. “I guess it could be seen as symbolic,” she commented. When all she received were stares, she shrugged. “Well, you know, spreadin’ life n’ all …” She shrugged again, then looked away, ostensibly to get the attention off her. “Enable,” came back a cold computer voice. Zoe nodded. Kayle and River looked spooked. “What’s the latest?” said Mal, who came up behind her. “That’s one massive piece of hardware,” said Mal, staring out at the tremendous ship filling more and more of the view outside. Kaylee and River glanced at each other and started giggling. Zoe, grinning, shook her head. “Seriously, Cap’n … I mean, look at it!” giggled Kaylee. Mal was about to respond when the comm sounded out. Deader, wagon plugged into a pilot-side port, fed the data into the program. It beeped. “There’s none,” said Mal flatly. “What does it do?” asked Kaylee, alarmed. She’d beaten Mal to the question; he glanced at her before gazing back at Deader. “Like gettin’ the clap,” commented Zoe. Given the shape of the great vessel filling more and more of the front viewports, and given the blue world they were falling into orbit of, no one found her observation anywhere close to humorous. The crew made their way to the hatch and waited. The lock on the other side pressurized, and then three solid knocks sounded out against Serenity’s hull. Mal pulled the door open and stared, then stepped hastily backward and pulled out his pistol. Inara screamed. The Alliance assassin who had tried to keep intel about Miranda from being broadcast to the Verse stood in the airlock two feet away and stared back.